If you're a criminal in China, you'll want to avoid its new death buses, vehicles that carry out executions while streaming live video of them, then provide some privacy for organ harvesting. 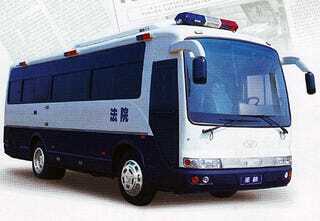 The buses, of which over 40 are currently in use, are replacing firing squads as China's preferred method of execution. The buses provide a setup for lethal injections, and the acts are carried out on streaming video so local authorities can observe and ensure that everything is done legally. Critics say that the buses help the government secretly harvest organs to sell to the west, as there's already a doctor on hand to administer the injection and they never show the bodies between execution and cremation. Chinese Death Bus: A Rolling Execution Studio?